voted on by the public, which drew nearly 1500 votes in total. 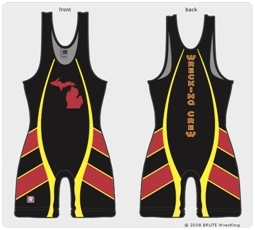 More than 60 entries had been submitted. As can be seen the theme of “chains” and the colours red and black were much in evidence amongst these finalists. The flag was registered following its unveiling on July 14 at the Museum’s Festival of Steam (see above photo) celebrating 300 years of the Newcomen Steam Engine. July 14th is recognised as the date that the engine, the World’s first steam engine, was erected in the area, heralding the steam age and industrial revolution. 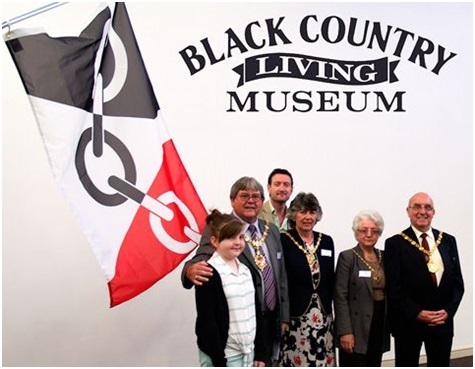 The ‘Black Country Day’ was agreed to by the museum and the Black Country Society. The flag and the commemorative date also celebrate Britain’s role in leading the industrial revolution. On the occasion, Andrew Lovett, The Director of the museum said “this design will wave the banner for the region’s unique identity, and its rich and diverse heritage”. 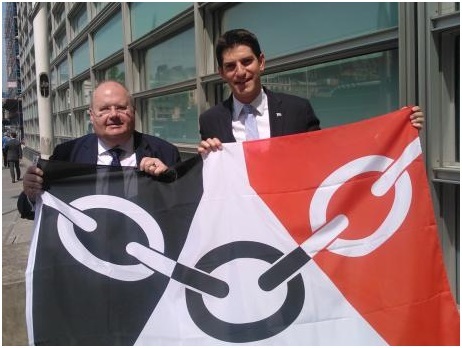 And another local MP, Tom Watson declared that he wanted to make ‘Black Country Day’ an annual event emulating the annual Yorkshire Day held on August 1 when towns across the county come together to hold events. Ann Key in 19th century costume with the Black Country Flag. 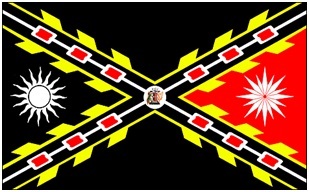 reported constantly running out of Black Country flags with one supplier resorting to ordering 9000 to cope with demand. 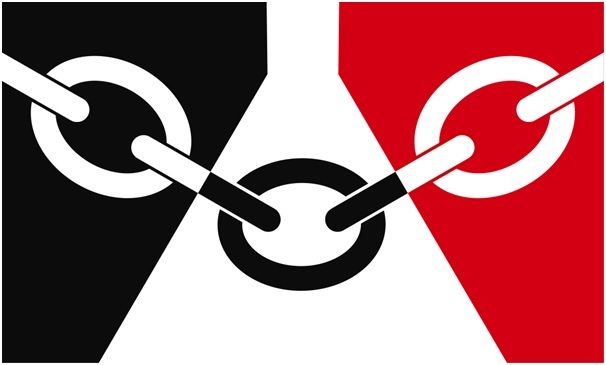 The scale and scope of Black Country Day has since built further. Events across most of the towns in the area comprise museum activities, guided tours, craft & industry demonstrations, beer festivals, music nights, sports tournaments, dog shows, comedy nights, car shows, educational talks, children’s activities, poetry readings, film screenings, theatre productions, tea parties, car shows, local markets, coffee mornings, discos, food tastings and town fayres with the Dudley hosting the flagship event on the closest Saturday, all put on specially. The Black Country charity road run has been moved from September to July to align with the date and businesses get behind the date with special promotions, business open days, special ales from the many local breweries, local buses even having discount fares and Black Country flag decorations. Even a dedicated phone app for the Black Country day & festival has been created. 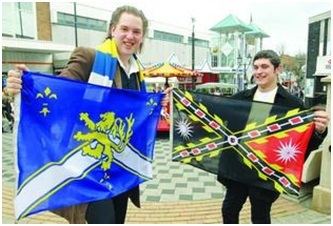 Before the official competition was launched by the museum the notion of a flag for the region had been trumpeted by regional native Philip Tibbetts, seen at left below. 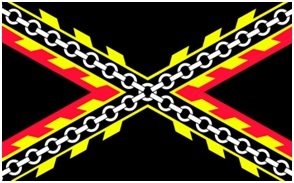 for the Black Country by proposing an idea for a regional flag. 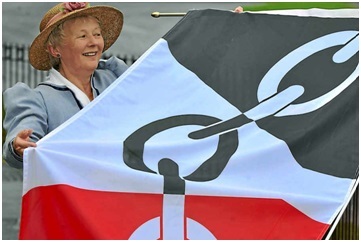 Like Tom Watson, Philip had hoped a flag would put the Black Country region on the map and to help to get publicity he created a design to attract media attention in 2008. This was Philip’s first attempt at flag design. It included the rich symbolism for which he is now well known. 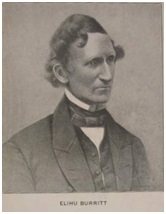 As he became more heavily involved in the world of the Flag Institute (where he has become a renowned designer and artist for community and county flags) he refined the flag as his skills developed – reducing the elements included and removing the “arms”. The team also carried his flag to bouts. 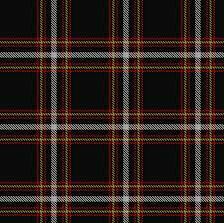 Following this interest in the flag Philip was able to approach the four local councils to sanction it. 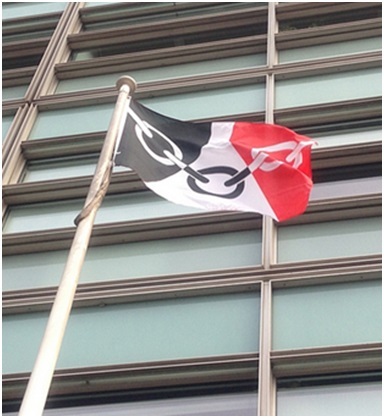 Walsall was the most supportive but ultimately the concept of a Black Country flag was not seized upon by all the councils together. to organise their own flag competitions. The museum also arranged for Philip to provide two full days of flag design workshops held within the museum itself, plus sessions with over 10 different schools from around the area. It was the museum who also brought on board the other competition stakeholders, each of whom had a representative on the “down-select panel” (which decided upon the six finalists) – the Black Country Society, the Express & Star newspaper, the University of Wolverhampton graphics department. The number and quality of designs were very high, attributable to the resources and engagement made available by the museum – ultimately the museum’s director had to be called in to make the final call! The vote itself was held on the Black Country Living Museum website and publicised by the Express and Star. 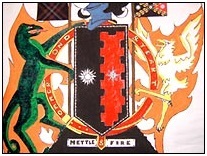 Although Philip had to agree not to submit his original design to the competition, it had achieved its intended purpose of getting the concept of the Black Country flag accepted. It is notable that several of the themes which originated with Philip’s designs appeared on the later competition finalists. In time his earlier designs helped to raise the issue of a flag for the area and Philip’s sterling work and cooperation with the Black Country Museum led to the creation of the competition. This entry was posted in Black Country. Bookmark the permalink.